Black seabirds circle high above the giant concrete dome that rises from a tangle of green vines just a few paces from the lapping waves of the Pacific. Half buried in the sand, the vast structure looks like a downed UFO. At the summit, figures carved into the weathered concrete state only the year of construction: 1979. Officially, this vast structure is known as the Runit Dome. Locals call it The Tomb. 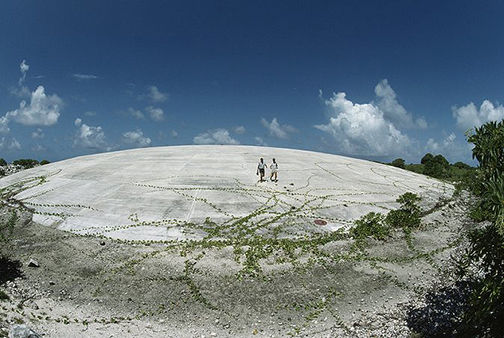 Below the 18-inch concrete cap rests the United States’ cold war legacy to this remote corner of the Pacific Ocean: 111,000 cubic yards of radioactive debris left behind after 12 years of nuclear tests. Brackish water pools around the edge of the dome, where sections of concrete have started to crack away. Underground, radioactive waste has already started to leach out of the crater: according to a 2013 report by the US Department of Energy, soil around the dome is already more contaminated than its contents. Now locals, scientists and environmental activists fear that a storm surge, typhoon or other cataclysmic event brought on by climate change could tear the concrete mantel wide open, releasing its contents into the Pacific Ocean. “Runit Dome represents a tragic confluence of nuclear testing and climate change,” said Michael Gerrard, director of the Sabin Center for Climate Change Law at Columbia University, who visited the dome in 2010. 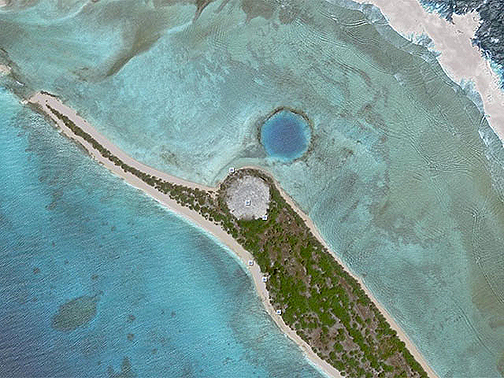 Enewetak Atoll, and the much better-known Bikini Atoll, were the main sites of the United States Pacific Proving Grounds, the setting for dozens of atomic explosions during the early years of the cold war. The remote islands – roughly halfway between Australia and Hawaii – were deemed sufficiently distant from major population centres and shipping lanes, and in 1948, the local population of Micronesian fishermen and subsistence farmers were evacuated to another atoll 200 km away. In total, 67 nuclear and atmospheric bombs were detonated on Enewetak and Bikini between 1946 and 1958 – an explosive yield equivalent to 1.6 Hiroshima bombs detonated every day over the course of 12 years. The detonations blanketed the islands with irradiated debris, including Plutonium-239, the fissile isotope used in nuclear warheads, which has a half-life of 24,000 years. When the testing came to an end, the US Defence Nuclear Agency (DNA – later the DoE) carried out an eight-year cleanup, but Congress refused to fund a comprehensive decontamination programme to make the entire atoll fit for human settlement again. The DNA’s preferred option – deep ocean dumping – was prohibited by international treaties and hazardous waste regulations, and there was little appetite for transporting the irradiated refuse back to the US. In the end, US servicemen simply scraped off the islands’ contaminated topsoil and mixed it with radioactive debris. 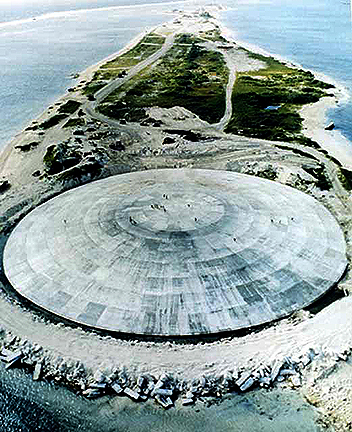 The resulting radioactive slurry was then dumped in an unlined 350-foot crater on Runit Island’s northern tip, and sealed under 358 concrete panels. But the dome was never meant to last. According to the World Health Organization, the $218m plan was designed as temporary fix: a way to store contaminated material until a permanent decontamination plan was devised. Meanwhile, only three of the atoll’s 40 islands were cleaned up, but not Enjebi, where half of Enewetak’s population had traditionally lived. And as costs spiralled, resettlement efforts of the northern part of the atoll stalled indefinitely. Nevertheless, in 1980, as the Americans prepared their own departure, the dri-Enewetak (“people of Enewetak”) were allowed to return to the atoll after 33 years. Three years later, the Marshall Islands signed a compact of free association with the US, granting its people certain privileges, but not full citizenship. The deal also settled of “all claims, past, present and future” related to the US Nuclear Testing Program – and left the Runit Dome under the responsibility of the Marshallese government. Today, the US government insists that it has honoured all its obligations, and that the jurisdiction for the dome and its toxic contents lies with the Marshall Islands. The Marshallese, meanwhile, say that a country with a population of 53,000 people and a GDP of $190m – most of it from US aid programs – is simply incapable of dealing with the potential radioactive catastrophe left behind by the Americans. “It’s clear as day that the local government will neither have the expertise or funds to fix the problem if it needs a particular fix,” said Riyad Mucadam, climate adviser to the office of the Marshallese president. Today, Runit – the setting for JG Ballard’s short story Terminal Beach – is still uninhabited, but it receives regular stream of visitors heading from neighboring islands to its abundant fishing grounds or searching for scrap metal to salvage. Approaching the island by boat across from the vast, shallow lagoon – the world’s second largest – the concrete structure is barely visible among the scrubby trees. Three decades after the Americans’ departure, abandoned bunkers dot the shoreline, and electric cables encased in black rubber snake across the sand. Nowhere on the beaches or the dome itself is there a warning to stay away – or even an indication of radioactivity. Enewetak’s senator Jack Ading, who lives in Majuro 600 miles away, doesn’t believe his home atoll is safe: resettlement efforts in Rongelap and Bikini atolls, also affected by testing, had to be aborted in the 1970s due to lingering contamination, despite safety assurances by the US. “Just close it off,” said Ading, who has called for armed guards to be stationed on the site – or at the very least the construction of a fence. Locals say they know there is “poison” on the island – there is no Marshallese word for contamination – but say that Runit offers one of the few sources of income on the impoverished atol. The US has yet to fully compensate the dri-Enewetak for the irreversible damage to their homeland, a total amounting to roughly $244m as appraised by the Nuclear Claims Tribunal, which was established by the US Congress in 1988 to adjudicate claims for compensation for health effects from the testing. Traditional livelihoods were destroyed by the testing: the US Department of Energy bans the export of fish and copra – dried coconut flesh used for its oil – on the grounds of lingering contamination. 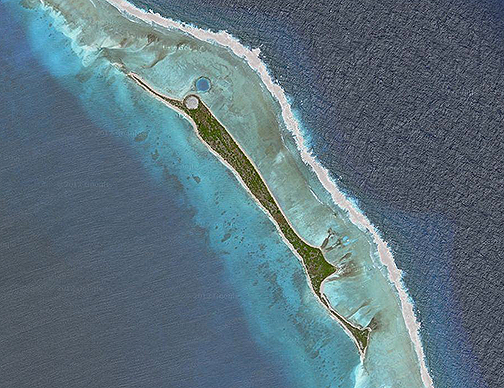 Nowadays, the atoll’s growing population survives on a depleted trust fund from the Compact of Free Association with the US, but payouts come to just $100 per person, according to locals. Many locals are deeply in debt, and dependent on a supplemental food program funded by the US Department of Agriculture, which delivers shipments of process foods such as Spam, flour and canned goods. The destruction a centuries-old lifestyle have lead to both a diabetes epidemic and regular bouts of starvation on the island. Those who can afford it have taken advantage of the Compact’s visaless travel benefits and migrated to Hawaii. “Enewetak has no money. What will people do to make money?” asked Rosemary Amitok, who lives with her husband Hemy on the atoll’s largest island. The couple eke out a living by scavenging for scrap copper on Runit and other islands on the atoll. For weeks at a time, they camp out in a makeshift tent on the island while Hemy digs for cables and other metal debris. The sell the salvage for a dollar or two per pound to a Chinese merchant who runs Enewetak’s only store and exports the metal, along with sea shells and sea cucumbers to Fujian in China. Other – and more worrying – traces of Enewetak’s history have also reached China: according to a 2014 study published in Environmental Science & Technology, plutonium isotopes from the nuclear tests have been found as far a the Pearl River Estuary in Guangdong province. Many people in Enewetak fear that one day the dome will break open, further spreading highly radioactive debris. As catastrophic weather events become more frequent, recent studies – including 2013 study of the Runit Dome’s structural integrity carried out by the DoE – have warned that typhoons could destroy or damage the cement panels, or inundate the island. A 2013 report commissioned by the US Department of Energy to the Lawrence Livermore National Laboratory acknowledged that radioactive materials are already leaching out of the dome, but downplays the possibility of serious environmental damage or health risks. “The waste within the dome is at least contained. There aren’t too many concerns for the Runit Dome to pose a threat to local people,” said Terry Hamilton, the scientific director for the Marshall Islands Program of the DoE-commissioned Lawrence Livermore National Laboratory. Hamilton said that cracks in the concrete were merely the result of long-term drying and shrinkage, but said the DoE was planning to carry out cosmetic repairs in order to restore public confidence. The DoE insists Enewetak is safe for human settlement today, and says it monitors local residents, groundwater, crops and marine life for radiation. Separate checkups are carried out on those suspected of digging for scrap metal. Though Enewetak is not allowed to sell its copra and fish, Hamilton insists the produce would satisfy safety standards on the international market. But locals complain that basic information – including results of their own tests for exposure to plutonium – is not readily accessible to them. Independent scientists say that salvaging Runit’s scrap metal may expose locals to much higher risks. “Those guys are digging in the dirt breathing in stuff in hot spots. That has to be hundreds of thousands times higher doses of potential health effects than swimming,” said Ken Buessler, a senior scientist and marine chemist at the Woods Hole Oceanographic Institution, who visited Runit and gathered samples of sediment in the lagoon earlier this year. 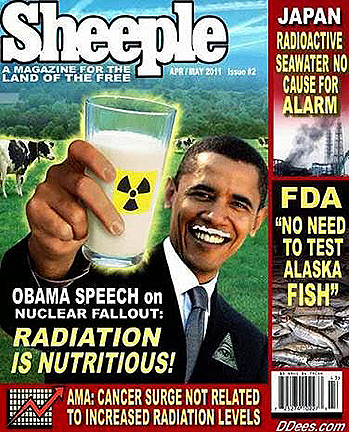 In 2012, Barack Obama signed legislation directing the DoE to monitor the groundwater beneath the dome, conduct a visual study of its exterior and submit reports determining whether contamination in the dome poses a health risk to the dri-Enewetak. In an emailed response to questions, US ambassador to the Marshall Islands Thomas Armbruster said that a recent meeting between the US, the DoE and the Marshall Islands government was “one of the best ever”. The minister himself remembers that encounter differently. Tony De Brum was nine years old and living on the atoll of Likiep, when he witnessed the blinding flash, thunderous roar and blood-red skies of Castle Bravo, the most powerful hydrogen bomb ever detonated by the US, which was tested at Bikini Atoll on 1 March 1954. Now the Marshall Islands minister of foreign affairs, he has since emerged as a voice for small island nations in international climate negotiations and leading advocate on the non-proliferation of nuclear weapons. De Brum is spearheading an ambitious lawsuit against the world’s nuclear powers, including the US, at the International Court of Justice. “We asked the Americans, are you going to put a sign on the dome that says ‘Don’t come here because you might get exposed’?” he said. The US has never formally apologized to the Marshall Islands for turning it into an atomic testing ground. When the UN special rapporteur on human rights and toxic waste, Calin Georgescu, visited the Marshall Islands in 2012 he criticized the US, remarking that the islanders feel like ‘nomads’ in their own country. Nuclear testing, he said, “left a legacy of distrust in the hearts and minds of the Marshallese”.